Our guitar servicing is one of the jewels in our crown, with countless customers commenting on the quality of our work and how it transforms the playing experience of their instrument. Considering some customers are willing to part with literally thousands of pounds on their dream instrument, there is no excuse for not getting the best out of it through a simple, regular set-up service. Put simply: it means configuring the guitar to get the best combination of tone and playability for you as a player. 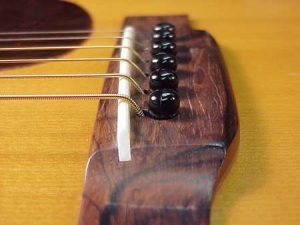 The ‘action’ (height of the string above the fingerboard) is just one aspect of this configuration, and changing it can have various consequential effects on the other aspects – some of which you may like and some you may not. Given that there are various ways to achieve a particular ‘action’ (such as grinding the saddle, lowering the back, dropping the nut or nut grooves, and adjusting the truss rod) we very quickly end up with many different parameters all interacting that combine to make the playing experience. Let’s go back to one of the comments above; the one that we hear most often when a customer leaves their instrument to be set-up: ‘I want it as low as possible without buzzing’. I’ll be clear: any guitar can be made to be as low as possible. That’s simple. We just keep lowering until it practically sits on one of the frets. Of course it will buzz and rattle with the most gentle of gentle touches but it will be a super low action. No amount of tinkering with anything else will help – if it buzzes then the strings are too close to one/some/all of the frets. Likewise, we can make any guitar not buzz: we just raise the strings and release the truss rod tension to the point where you could do a little dance under the strings. It will play like a bar-steward but it won’t buzz when you play it. So where is the holy-grail ‘universal point of perfection’ that is so desirable when getting your guitar set up? Frankly, it is impossible to tell without knowing more about you, how you play, how hard you play, and what your actual tolerance to buzz is. Let’s flip it on its head: just as we can make any guitar not buzz, any player – if they try hard enough – could still make that guitar buzz if they played in a certain way. Playability and susceptibility to buzz is as much about the player’s fingers and technique as it is about the guitar. When we discuss this with our customers, the reality slowly starts to ferment and distill in their minds: the ‘action’ is just one small constituent aspect of setting up their guitar, and that aspect on its own is affected by several different parameters of the guitar, as well as their own perception and their own technique. So even when the ‘action’ is sorted, we still have to be mindful of the intonation, string gauges, amplitude (volume / tone) and how they all interplay with each other. So how do we go about establishing how to set up a guitar for a customer? Any set-up is a compromise and so when we know what trade-offs the customer would rather have, we better know how to proceed. Most customers who come in concerned entirely with ‘action’ are likely to be happy to slightly trade-off tone and intonation in order to get an easier playing experience; customers who have a strong attack and want a big sound with no choking will likely trade-off a little playability and accept a higher action; and customers who want to play fast and bend a lot will probably accept a slight loss of tension on the bass strings in order to get a low playing action yet allow good bends without the note choking out. Of course, the quality of the guitar does play it’s part, and that is probably where some of the myth that ‘good guitars come with low actions’ originates; an even neck with consistent frets is much easier to get a lower action without it rattling away on whichever uneven fret is the highest. As long as we remember that good guitars often have high actions. Look at a £5000 guitar by C.F. Martin and the strings won’t be super low. But I bet it sounds stunning! Hopefully this is all making a little more sense. But why does lowering the action affect the tone? Or potentially affect the intonation? Put simply: lowering the action reduces the ‘break-angle’ of the string over the saddle. The ‘flatter’ the string is over the saddle, the less it is pushing energy down into the top. The less energy, the less the top is stimulated to vibrate. For obvious reasons this has a greater effect on acoustic instruments. 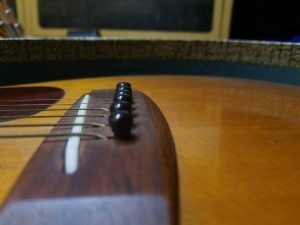 The same effect is experienced if a lower string gauge is used to make a guitar more playable: with any given length of string, a thinner string is less taut at the same pitch than a thicker string. That’s simple physics. So when players swap out their string gauge they are throwing another parameter into the mix. There’s no such thing as a guitar set-up being ‘good’ or ‘bad’. It just is what it is. It is up to you to decide what you want from the instrument and what trade-offs you will accept as a result. Want it as low as you can without buzzing? I want a car that will do 0-150 in 5 seconds and does 300 miles to the gallon! See the symmetry with that analogy? The occasional buzz and rattle isn’t the end of the world if it gives you a playing experience you are happy with. It has to be very bad to be noticeable through an amp. When you get your guitar set up, tell the experts who are doing the works exactly what you want the guitar to do. They have much more chance then of finding the right configuration for you. This is simply the best advice I’ve heard for years. another way and my electric yet another. Different styles of playing demand different setups and should be tailored to the individual. get it wrong and your guitar could become an expensive piece of firewood. Thanks Mike. It is great to get some feedback, and you are correct in that there is no single way to set up a guitar, even if it is for the same player. I saved up for a Yamaha FG335 from Rushworths in Liverpool, properly setup (although I didn’t know what this meant then) and it set me up for years. Incidentally I still have both, since had my Kay setup properly and it’s a fab slide guitar! Thanks Ian – just goes to show what a difference having a guitar well configured makes.